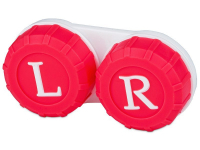 This handy and thin lens case with the helpful „L“ and „R“ symbols for easy handling and storage of your lenses is available in a striking strawberry red colour. This classic case is suitable for most contact lens users. Functional design also available in orange, green and blue colours.